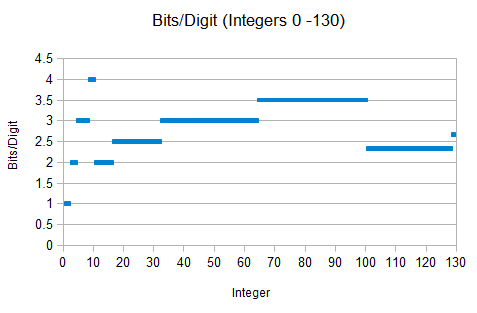 Excluding 0 and 1, it takes more digits to express an integer in binary than in decimal. How many more? The commonly given answer is log2(10) ≈ 3.32 times as many. But this is misleading; the ratio actually depends on the specific integer. So where does ‘log2(10) bits per digit’ come from? It’s a theoretical limit, a value that’s approached only as integers grow large. I’ll show you how to derive it. The graph above shows this ratio for n equal 0 through 130. As expected, the ratio varies; it zig-zags, changing at power of two and power of ten boundaries. When you cross a power of two, the number of bits goes up, so the ratio goes up; when you cross a power of ten, the number of decimal digits goes up, so the ratio goes down. This variation continues forever — but does the ratio ever converge? Let’s take a look. Now that looks like it’s converging (at least to 3 places). It turns out it does converge — I’ll prove it. You can apply the above analysis to representations in any pair of bases. How about the ratio of bits to octal digits? This works out to be . Similarly, the ratio of bits to hexadecimal digits is . Of course, this is not surprising, since everyone “knows” there are 3 bits per octal digit and 4 bits per hexadecimal digit. But remember that I’m talking about pure mathematical representations, not fixed-sized computer representations with explicit leading zeros. For example, 17 octal = 1111 binary, a ratio of 4/2 = 2; 1f hexadecimal = 11111 binary, a ratio of 5/2 = 2.5. > but I don’t have a proof. Any takers? It means any 4N-digit binary number (which is always greater-or-equal than 2^(4N – 1)) is always greater than any N-digit decimal number. So, binary for the same number can’t be 4 times longer anymore. The proof is easier if you use ceilings. Let B(n) be the bit length and D(n) be the decimal length. B(n) = ceil(log2(n+1)) and D(n) = ceil(log10(n+1)). Please explain what you are trying to show.